Gender Based Violence Awareness Event a Success! On January 19th, Shooting Touch hosted a community event to raise awareness regarding GBV and present suggestions on how to conquer GBV and its negative impacts on society. Shooting Touch uses basketball as a platform to educate and empower at-risk youth, women, and their communities in rural Rwanda to live healthier and happier lives. Men’s Resource Center (RWAMREC), Fidele Rutayisire, to speak to those in attendance on what it really means to have gender balance at home and in the community. Shooting Touch also distributed informative pamphlets defining the different types of GBV, statistics representing GBV prevalence in Rwanda, and where to go/who to call if they, or another individual, are victim to GBV. Adding to this, a nurse from the Rukara Health Center, spoke on “One-Stop Centers” in Rwanda; support centers in every village, available to victims of abuse and other health matters. Twice a year, Shooting Touch invites communities together for a greater cause, aiming to influence all demographics, regardless of their constant involvement in daily programming or not. Using the sport of basketball as a means of engagement, ST hosts their International Women’s Day tournament and Gender Based Violence Awareness tournament in partnership with various local health and empowerment organizations working towards common goals. These tournaments offer fun competition for participants and entertainment for over 2,500 people in attendance. 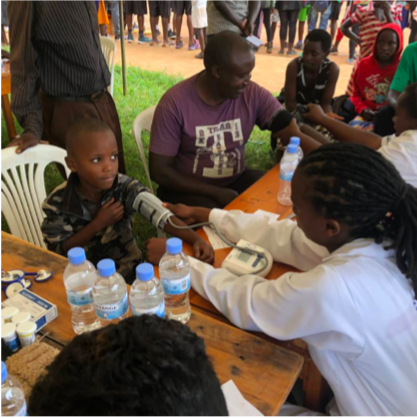 ST also takes this opportunity to educate spectators as well as provide free health testing for participants and community members.